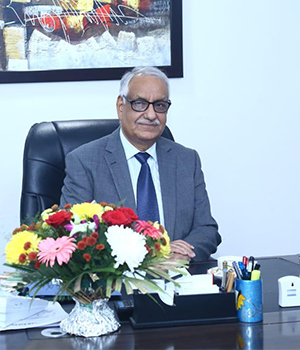 The Jamia Hamdard (Hamdard University) was granted Deemed University status by UGC/GOI in 1989 and NAAC ‘A’ grade University status in 2002 in its first accreditation cycle and continues to remain in ‘A’ category for the third cycle held in 2017. The advisory committee constituted in 2009 on behalf of Hamdard National Foundation (HNF), the promoter trust of the University, accepted the concept of establishing a modern medical education institute on the main campus of the University as a constituent Institute of Jamia Hamdard. Detailed Project report (DPR) developed through a medical consulting company was approved by HNF and Executive Council of the University thereafter. Thus Hamdard Institute of Medical Sciences and Research (HIMSR) became the latest constituent within the family of education institutions established by HNF. A 470 bedded modern state-of-the-art teaching hospital, Hakim Abdul Hameed Centenary Hospital (HAH Centenary Hospital) named after the founder was built with full financial support of HNF and attached to the Medical College in 2010-11. The Medical College and its teaching hospital was granted all requisite permissions by MCI, GOI and Delhi Govt. and the first LOP for intake of 100 MBBS students was granted in June 2012. Price Water Coopers (PWC), a well-known international consulting company was engaged to prepare and introduce a working document on Institutional Organogram, Administrative structure, Organizational effectiveness and interface interaction & working relationship with the University. The guiding principle for operational framework was based on Medical Council of India’s distinctive regulatory norms, standard operating procedures and faculty cadre structure & career advancement strategies different from UGC stipulations prescribed for Universities. HIMSR though a private category Modern Medical College, decided to admit students based on AIPMT/ NEET (all India merit) right from the beginning even when it was not mandatory then by law to do so for Private Colleges. As a result the Institute emerged as one of the few preferred private Medical colleges for meritorious students from all over the country. In the first NIRF ranking platform introduced by MHRD GOI, HIMSR emerged at 11th rank on all India basis and 3rd rank Medical Institute in New Delhi/ NCR after AIIMS and ILBS or 2nd rank for Delhi/NCR Medical colleges granting MBBS degree mainly due to high quality teaching and research outcome of the faculty. First batch of 100 MBBS students admitted in 2012 was granted UG degree (MBBS) in 2017 and half of them were admitted for PG in prestigious medical colleges in the country at their first attempt for admission. HIMSR is a proud destination of highly motivated and careerist medical professionals drawn from prestigious institutions of the country. Medical Research activities at UG/PG level right from the early stage of admission is the hallmark of HIMSR. Our undergraduate students compete for research projects during their 2nd professional stage itself and a number of such studies are carried out in the college under the able mentorship of learned faculty. The Institute was granted recognition by MCI/GOI with effect from 2016 for a period of 5 years under Indian Medical Act 11(2)1956. The institute has already been permitted to admit students for PG in para and pre-clinical subjects and is looking forward to the letter of permission (LOP) in 10 clinical subjects for 2019-20. The Institute teaching hospital is and its three Community health centres in Delhi are catering the health care needs at an affordable cost to a large section of needy people in south and south eastern region of Delhi. The annual figures of OPD patients has touched half a million mark within the short period of 6 years of its establishment and patient bed occupancy has crossed a figure of 1.25 Lakh patients per year. These numbers is an indicator of services rendered by HIMSR in addition to the excellent clinical material available for teaching of UG & PG Medical students and pre-clinical and Paramedical students produced by the Medical College. Whereas, I give the major credit of all above achievement of the Institute to over one thousand strong, dedicated Faculty, Resident doctors, Nursing staff, Technical and Non-Teaching staff and out-sourced service cadre engaged at the Medical College, however, all these achievements would not be realised without unstinted support of Chairman and Board Members (Majlis-e-Awan) of Hamdard National Foundation. I wish all our students, Faculty and staff a pleasant and successful association with HIMSR.